// Between the lines //: Awarded! I received an award on Monday. 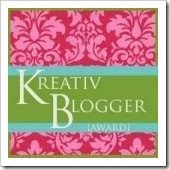 The Kreativ Blogger Award! From Cindy of Quaint Handmade! Thanks, Cindy! You won't get an acceptance speech, but instead I'm asked to share seven things which you might not know about me. Seven, really? I mean: only seven? 1. // Between the lines // - What's in a name? The hardest part about starting a blog was finding the right name. It took several weeks of thinking. I don't recall exactly when or how I came up with // Between the Lines //, but it felt right instantly. It reflects part of my personality, I guess - I like to stay within the lines, am not a risk-lover and usually stick to the rules. Also, I'm not a very open person, a bit private - sometimes you need to read between the lines to get to the deeper sense. And graphically, too, I like nice, clear cut and strong lines. Hence, // Between the lines //. 2. Tulips are my absolutely favorite flowers. My wedding bouquet was entirely made out of tulips. White with a twist of yellow tulips. So lovely! 3. I've been using the same fragrance for over twenty years: Cristalle by Chanel. I've tried other fragrances, but to no avail. Cristalle is the one and only for me. Fresh and subtle. I dread the day Chanel decides to take it off the market. 6. My feet grew one size bigger during my last pregnancy and never shrunk back, somehow. 7. I sob when watching movies (even kid's movies) which can be quite embarrassing. I remember watching "An officer and a gentlemen" at my uncle's when I was a teenager, and how I burst into tears at the end and couldn't stop crying... So embarrassing! Hey, and that makes seven! So, now I get to nominate seven people. I hope you don't mind Rosa Maria, Andrea, Jane, Britt, Nö, Virginia and Mon Ami.